Mobile Safari on the iPhone will finally have some real competition. Today, Opera announced that the Opera Mini browser should be available in the iPhone App Store, for free, within the next 24 hours. This is big news. Up until this point, Safari Mobile has been basically the only real browser available for the iPhone. There are quite a few other browsers available, but they are all based on the Webkit engine (the same engine used to power Safari Mobile). 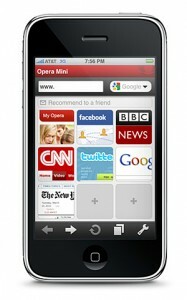 Opera Mini is the first fully competitive browser to be released on the iPhone. In addition, this will help expand Opera’s mobile market share. Although Opera has a very low adoption rate among desktop users, Opera is extremely pervasive among mobile devices. Although it’s difficult to find reliable, dependable statistics for mobile browsers, some reports indicate that Opera Mobile has the highest market share among mobile browsers (above Safari Mobile). Imagine how much stronger that hold on the market can get, now that Opera Mini will be available on the iPhone.